"One of the most ambitious canvases is by Anthony Eterovich of Cleveland - ‘Table Charade', which might have been called ‘The World is Full of a Number of Things' and succeeds in bringing organization out of what might well have been a too complicated profusion of detail." His work is known for profound color and imaginative, almost whimsical choices of subject matter. His exhibitions include: the Cleveland Museum of Art May Shows from 1934 to 1971; the Butler Institute for American Art from 1939 to 1970. During his lifetime, Eterovich had two solo shows at the Women's City Club in 1956 and the Intown Club in 1963. Also, in 1963, he had several oil paintings in a show called "Thirty Cleveland Artists" which previewed in New York City, opened in Great Neck, New York and culminated in another month of exhibition at the Circle Gallery in Downtown Cleveland. Eterovich was featured at The Country Inn and Stables at Walden and the Cleveland Institute of Art Faculty Shows from 1951 to 2005. Since his death in 2011, Eterovich's work has been featured at ARTneo and the AAWR. The centennial of his birth was marked with his work on exhibit at four major organizations in Cleveland including the Cleveland Institute of Art Study Collection, ARTneo's "Fundamental Gestures", "Out of the Archives" by the AAWR at the Beechwood Community Center and a full retrospective of 47 paintings, drawings and watercolors at Tregoning & Company, all in the Cleveland or greater Cleveland area. Anthony William Eterovich was born in Cleveland, Ohio on April 2, 1916. His parents, George and Anna, emigrated from the Dalmatian coast of what is now Croatia. From the time he was three, Eterovich had a pencil in his hand and his family was somehow able to provide him with the materials he needed to express himself on paper. He was influenced by living through the Great Depression and serving in the Army during World War II. He was drafted and achieved the rank of Sergeant Tech Four in the Army where he did more than thirty portraits of his peers, colonels, captains and a three star general. He was called upon to draw maps and create topographical visualizations of landing and occupied areas and silhouette identification of enemy aircraft and other vehicles. In addition, he taught French while stationed in Indian Town Gap, Pennsylvania from 1943-1944 and then Camp Gordon Johnston in Florida from 1944-1945. A portion of these pictures have been turned over to the Cleveland Institute of Art. In 1934, Eterovich won a scholarship to the Cleveland Institute of Art where he received a degree in portraiture in 1938. After the army, he went on to receive a Bachelor of Science in Education and a Masters Degree in Art Education from Case Western Reserve University in 1947. He continued with honors in extended studies at Ohio University in 1948-1949 and the New York Art Students League in 1950-1954. He did more than 30 portraits in Indian Town Gap, Pennsylvania and at Camp Gordon Johnson in Florida but the bulk of his painting has been done in the Greater Cleveland area. In 1950, he married Alice Troyan and had one daughter, Karen. Influences on his work include Renoir, Degas and Manet for color and Edward Hopper and Richard Estes for cityscapes and photo realism. He studied and was influenced by Cleveland School of Art's finest painters including John Teyral and Viktor Schreckengost. Additionally, he studied with Jack Levine and Alexander Yakovleff; both had residencies at the Cleveland Institute of Art. 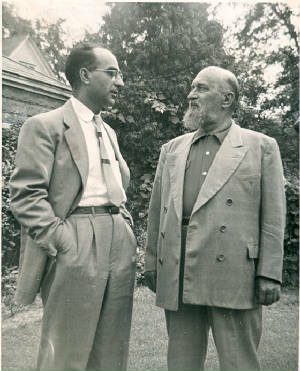 Other artist/teachers who influenced his work were Aaron Bohrod at Ohio University and Robert Motherwell at Oberlin College. Anthony Eterovich taught for more than thirty years in the Cleveland Public School System. He was at Lincoln High School from 1948 to 1961. 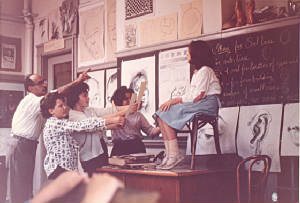 Eterovich was promoted to Chair of the Art Department at Rhodes High School from 1962 to 1978. After retirement, Mr. Eterovich was chairman of the Regional Scholastic Art Competition from 1981 to 1989. He remained at his alma mater, the Cleveland Institute of Art, where he taught life drawing in the Adult Evening School and the weekend and summer sessions for fifty-four years. Please contact bill at tregoningandco.com for information about drawings, watercolors and paintings. Contact Amy Raufman, Vice President for Institutional Advancement at the Cleveland Institute of Art, for information on the Anthony Eterovich Scholarship for Drawing.